In a bifurcated U.S. food market, where one market is largely controlled by national brands and global corporations alongside an expanding alter­nate market of hyper-local direct sales, midscale producers and processors are struggling to persist. One emerging strategy for rebuilding this middle of the food system—food hubs—has gained attention as a model that could rebuild local food economies and equitable food access. Through an examination of Michigan food hubs, we ask about the extent to which and under what conditions food hubs can operationalize dual economic and social goals. 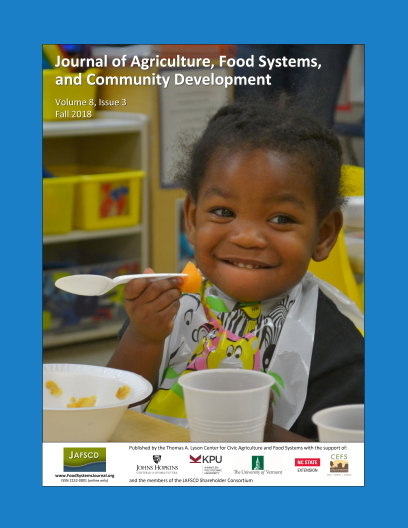 We found many innovations and efforts to address food access in low-income communities—espe­cially among food hubs that were nonprofits, had been operating for less time, and were more dependent on external revenue—but their impact tended to be small-scale and uncertain. Most food hubs want to do more, but our study suggests they may not be able to until they can figuratively “put on their own mask before helping others.” That is, food hubs may be one means of increasing afford­able, healthy food access in certain scenarios, but equitable food access may be an unrealistic and unsustainable goal unless they can ensure their own financial stability. Among other options for satis­fying the requirements for equitable food access, financial survival, and returns to the farm gate, our findings suggest that food hubs attempting to reduce food access inequities may need to be subsidized as a public good, unless and until the public sector commits to a more comprehensive strategy to address food system failures.